6.) Launch UEFITool and open the file and click on “Intel Image”. This may be the chicken with the golden egg! Initially I only had four of the entry level MacBook Pro. The one without the new Touch Bar/Touch ID. Now I also have some of the MacBookPro13,2 and MacBookPro13,3 And more will be added once they become available. p.s. Not all links will be forwarded to the support document – Apple has to update them first. Update: New Geekbench results of the Intel i7-6660U @ 2.4GHz have emerged and can be found here. // Intel Core i5-6360U 2.0 GHz (Max Turbo Boost 3.1 GHz). // Intel Core i7-6660U 2.4 GHz (Max Turbo Boost 3.4 GHz). // Intel Core i7-6700HQ 2.6 GHz (Max Turbo Boost 3.5 GHz). // Intel Core i7-6820HQ 2.7 GHz (Max Turbo Boost 3.6 GHz). // Intel Core i7-6920HQ 2.9 GHz (Max Turbo Boost 3.8 GHz). Note: This data was initially added to RevoBoot, but it can be used with any boot loader! Update: HWP is set to 1 (enabled) in the FrequencyVectors data in the plists. Update-2: Intel® HD Graphics info added. 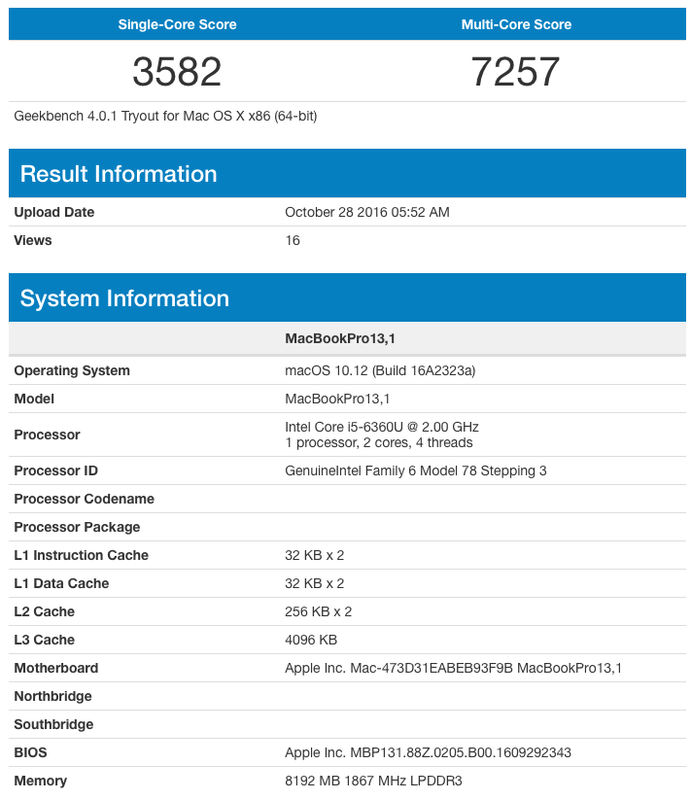 Update-3: A new Geekbench result have emerged with BIOS MBP132.88Z.0226.B00.1610231055. One that I cannot locate in any of the currently available firmware update packages. There is only one reason for me to get a new MacBook Pro with Touch ID, and that is to hack the crack out of it. I tell you this. This new Touch ID feature is most likely far from secure. Your fingerprint on it will be there waiting for criminals to use it. All they need is your shiny new MacBook Pro, after that not only your MacBook Pro will be gone, but your money as well. In short. I am not going to use Apple Pay. Thanks but no thanks! Note: The new MacBook Pro is a really beautiful piece of hardware, but I am not going to use a notebook, not for as long as my iPad Pro does what I need. A new update of ssdtPRGen.sh (v21.1) is now available from my Github repository. There is also Mac-4BFBC784B845591E (IGPU only) but that one isn’t yet used. This one is most likely declared for the new MacBook Air. Edit: Actually. I have no idea why I said that. Honestly. Nobody but Apple knowns what it will be used for. A BTO one perhaps? Please do not use my blog for bug reports.